Durable metal storage sheds for sale at carports and more are the best thing you can get when you find yourself besieged with lawn and garden tools, playthings for the children, pool equipment, patio furniture and more. They\'re very handy for knowing where everything is, and they come in a wide variety of designs, colors and materials. If the convenience of having more space has sparked your interest, read on to find out more. Fact No. 1: Metal storage sheds are easy to find online. A simple search of websites like ours will reveal an abundance of quality metal storage sheds. These shed prices can be made to fit any budget. They are also weather resistant sheds and should last you at least ten years or even longer if properly maintained. It\'s a great asset for your backyard and your tools. Fact No. 2: Steel storage sheds have many uses. Use yours as a storage playhouse for your children, or for special hobby shed. There\'s a great deal of space provided by our portable metal storage sheds to spread out your tools and designs, and you won\'t be bothered by distractions, as you would be in the house. Stop using your garage for storage; remember it was designed to hold your car, not your tools! Fact No. 3: Our metal storage sheds are far from utilitarian (read: ugly). Our Metal storage sheds are made of the finest materials, and they won\'t get ugly over time. We also have canvas sheds for sale with metal frames, and these have high-profile white interiors that provide added illumination, while the heavy-duty all-steel frame; bonded with Dupont™ thermoset baked on powder-coated finish prevents chipping, peeling, rust and corrosion. The portable metal sheds available at Carports and More can be used for a broad selection of purposes besides the standard place to keep tools and lawn equipment, our portable DIY sheds are the perfect addition to any type of backyard or outdoor space. 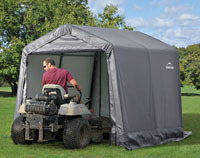 Choose one of our Portable home storage sheds for durability and maintenance-free care. These are generally the least expensive, yet they provide as much functionality as any of the other alternatives.